McALLEN — City commissioners on Monday ordered Catholic Charities of the Rio Grande Valley to vacate their central McAllen respite center, which has served as a temporary shelter for immigrants who cross from Mexico into the United States once federal authorities release the immigrants from custody. The 16,000-square-foot respite center, which sits near the intersection of Hackberry Avenue and 2nd Street, has been accommodating hundreds of daily immigrants since December, when the number kept increasing and Catholic Charities needed more space, so it moved its downtown operations to this former nursing home. After city commissioners heard from several residents living near the respite center, commissioners ordered Sister Norma Pimentel, president of Catholic Charities of the RGV, to find a new facility within 90 days. But the vote at Monday’s city commission meeting was divided. Mayor Jim Darling and Commissioners Joaquin “J.J.” Zamora and Omar Quintanilla voted to remove Catholic Charities from the former nursing home within 90 days. Commissioners Veronica Whitacre and Javier Villalobos voted the other direction. Multiple commissioners felt a need to explain why they voted a certain way, an unusual occurrence at city meetings. Whitacre, in her defense, said she wanted Catholic Charities to vacate the building sooner than 90 days. Commissioners Aida Ramirez and John Ingram were absent from Monday’s meeting. Tensions at the meeting grew once a handful of residents living near the respite center described their peaceful neighborhood being upended by constant traffic and strangers wandering the streets, likely coming from the respite center. “The citizens and the community is also mine. I care about people, and I believe that what we are doing in the respite center is not affecting the community in a negative way, by all means,” Pimentel said. “We are working very diligently to make sure that these families get the care they need, but at the same time, doing it in a way that we respect the neighborhood and the people because the families that we receive who come into the building, stay in the building. They don’t go wandering around. Pimentel declined to speak after the city commission meeting. The residents, meanwhile, were happy with the city’s decision, and emphasized that they support Pimentel’s mission, but not in a residential area. “We stand against the placement of the respite center in the neighborhood, any neighborhood,” Alicia Zamora told commissioners during the meeting. 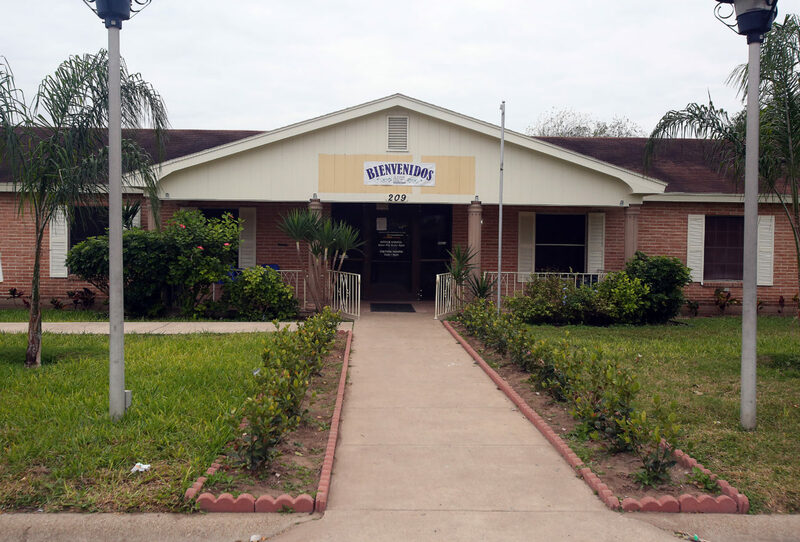 Pimentel, who has received national attention for her immigration efforts, moved the respite center to Hackberry Avenue in December after four years at multiple locations in downtown McAllen. Since 2014, federal authorities had dropped off asylum-seeking immigrants at the downtown bus station, where Catholic Charities workers would assist the immigrants. For the first few years, the downtown Sacred Heart Catholic Church hosted the respite center. In the Fall of 2017, when immigration numbers dropped, Pimentel decided to move the facility to a rented property a few blocks down in an effort to return the church’s parish hall to its formal functions. For years, Darling has hammered the federal government for its weak foreign policy in Central America and immigration laws, because border cities like McAllen have had to fill in the gaps. And recently, immigrants have been crossing the southern border in greater numbers. In January, 43,588 so-called family units were apprehended in the U.S. Customs and Border Protections’ Rio Grande Valley sector, which encompasses all of South Texas. “Whatever we do, even if it’s a federal problem, we don’t get reimbursed for our expenses,” Darling said at Monday’s meeting. Darling and Villalobos said if McAllen didn’t help in assisting these immigrants, they don’t know where they could end up. “We’re in a position we don’t want to be in,” Villalobos said.